Summer has officially come to an end; but that doesn't mean that we have to stop getting our glow on. Personally, I don't mind sporting an illuminating, sun-kissed complexion all year round. It not only gives my face a warm healthy look, but it also helps liven up my face and eliminate the dull, lackluster appearance that is a common recurrence come winter. 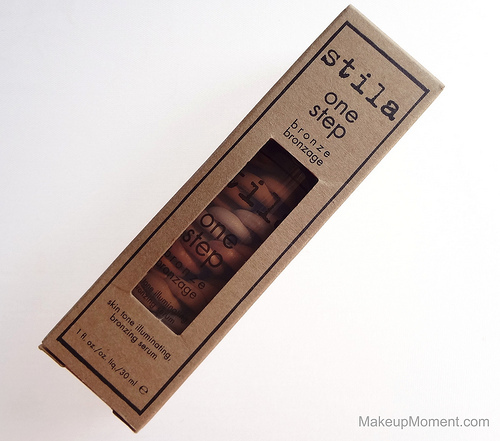 I received a full-sized bottle of Stila's One Step Bronze ($36.00) in my June 2012 Birchbox, and I couldn't be anymore pleased with it. Stila's One Step Bronze is comprised of a triple swirled helix bronzing serum that nourishes, primes, illuminates, and bronzes the skin. The three swirls each have different color tones and their own unique abilities. The matte bronze helps color correct and warm up the skin, the luminous bronze is great for illuminating and enhancing the complexion, and the ever so lovely kitten shimmer brightens, illuminates, and diminishes the appearance of sun spots. Oh how I just love multipurpose products. They certainly make the product that much more interesting, I think. This product is also infused with an exclusive "Youth Revival Bio-Available Mineral Complex" which not only helps balance and hydrate the skin, but it minimizes pores, diminishes the appearance of fine lines and wrinkles, and controls oil. I love the pump bottle packaging. It's hygienic, travel friendly, and the pump is easy to control and dispenses just the right amount of product, every time. When pumped out, the three swirls combine and create a light terracotta bronze color. So pretty. The texture of the bronzer is very smooth, and contains a mousse-like consistency that feels lightweight on the skin, and makes blending a dream. After blending with clean fingers, right away I notice a seamless, natural looking warmth to my skin-with a little glow to boot. I am an NC25 in MAC terms and before I tried this product, I thought the color would be too dark and obvious on my skin tone. But when I saw the results, I was surprised to see that the bronze tint didn't look off at all. 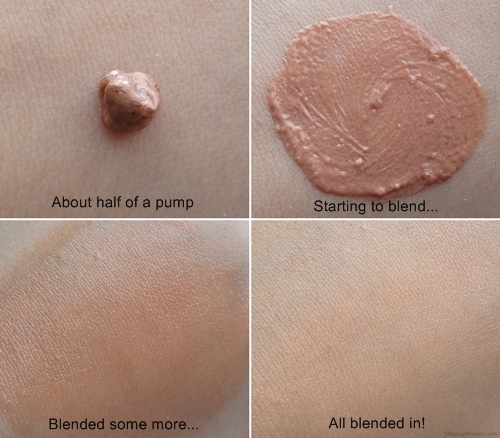 The color somehow merges with my natural skin tone to create the most perfect little boost of color that's not only very flattering, but forgiving as well. There is definitely no orange here. I find that a half of a pump is enough to cover my entire face. A bit of product goes a long way, so I am sure this bronzer is going to last ages. I suggest working fast when blending, as this bronzer does have a tendency to dry and set pretty quick. After it sets, it doesn't leave behind a sticky or uncomfortable feeling. I am left with soft, touchable skin. It may be hard to tell by my swatches but this bronzer contains a pretty hefty load of small, golden copper micro-shimmers. The shimmers are not super apparent on the skin, they don't settle in the pores, nor do they look overbearing. Instead, the shimmers aid in providing the skin with a luminous glow that can be spotted from a mile away. It's a very beautiful effect that I have grown quite fond of. Weather it be mineral or liquid foundation, they easily glide over Stila's One Step Bronze. This product can of course be used by itself if desired, but I always layer a foundation over it. That way, I get the warmth, along with some coverage, too. The warm, luminous effect prolongs all day on my skin, and this product plays well with my dry, oily, and sensitive skin. It doesn't enhance dry areas, hasn't caused any negative, adverse reactions, and this bronzer does not make my already oil-prone areas, anymore oilier. Love! 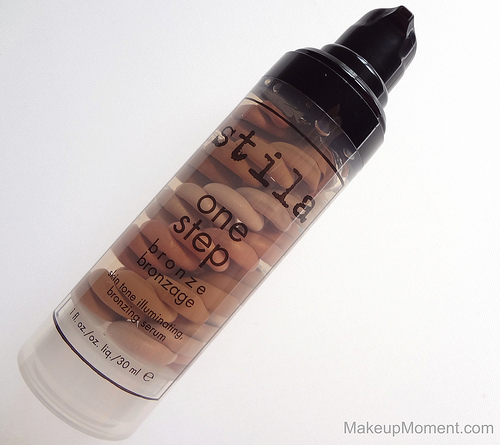 Overall: Stila's One Step Bronze is all that and more! This is absolutely the loveliest product to help me easily achieve a natural looking, warm, lit from within light bronze glow. And the fact that it's a multipurpose product with skin benefits is an added bonus. Stila's One Step Bronze is definitely something I reach for often when I want to give my skin a warm boost-which is pretty much almost daily. This is an awesome product to have handy for year round use, and I can't recommend it enough for those who are seeking a warm and illuminating appearance to their complexion. What do you all think of Stila's One Step Bronze? Disclaimer: I am not affiliated with any of the companies mentioned above. I received this product in my Birchbox, which I pay a monthly subscription for. It looks so natural! I love Stila products, they make amazing things! I think you will like this product, Niki! :) Let me know how it works out for you if you decide to get it! Looks pretty but it wouldn't show up on me.